Includes pickup, storage, and delivery directly from your room. The easiest storage solution for students at the University of Michigan. Flexible storage lengths perfect when moving between homes, during renovations or for excess belongings. Only pay for the space you use. We provide the most convenient storage option for students when moving at the University of Michigan. Pay a one-time, flat-rate per item stored. This rate will cover picking up your item(s) from your room, storage for a designated length and delivery back to your new room when you return to school. You can always retrieve your items early or extend your storage on a month-to-month basis if your plans change. Our storage service eliminates the headache of renting multiple moving trucks, moving companies, and dealing with self-storage, only to repeat the process during move-in. One call and we can move your belongings to our Ann Arbor, MI facility for storage. Schedule a delivery anytime and we’ll move them directly to your new location. 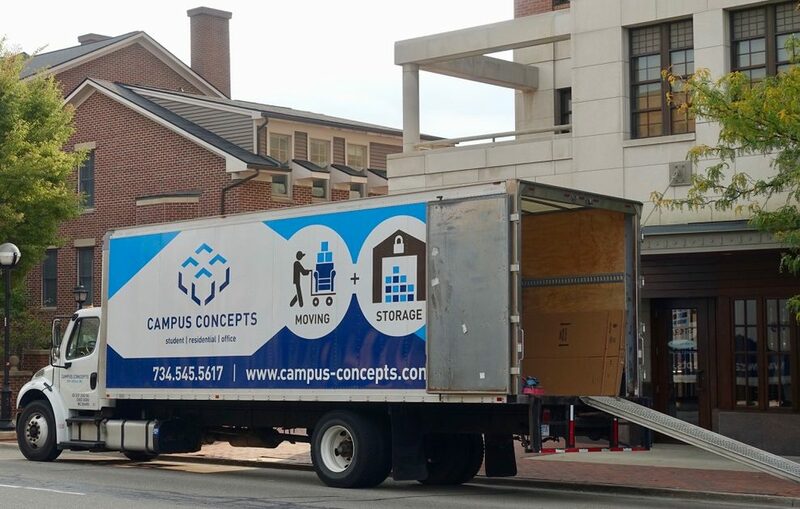 Campus Concepts is a fully licensed and insured moving company. The peace of mind when moving with us is priceless. Our professional movers are employees of Campus Concepts. We never outsource any of our services to contractors or van lines. However rare, accidents can happen. Our comprehensive coverage options ensure your belongings are always protected.